Monday 28th May 2018 Python will always run in a separate instance, even if called form the main LayoutEditor application. So you always need to store the results to disk within Python and need to load it into the LayoutEditor to see the results graphical. 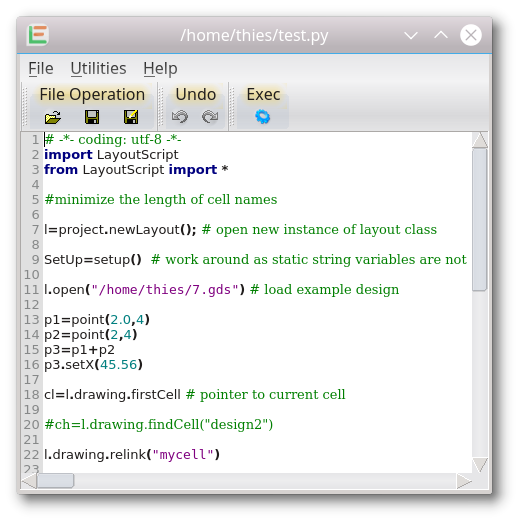 As a result you will be able to run LayoutScript for Python independent of the main LayoutEditor application and can use it for automation tasks. This is in contrast to C++-Macro where you can access the current open design and do any operation on it. Tuesday 29th May 2018 Thank you it's working. Is there any other way to change the Instance of the pcell properties other than going into the python script and editing all the time. It looks bit tedious, if want to change the properties of the pcell by calling it's Instance how easy to do so?Thanks again..
Tuesday 29th May 2018 I guess you don't have a real parametric cell, but a simple script. Examples for parametric cells you will find in the *shape library* of the LayoutEditor. 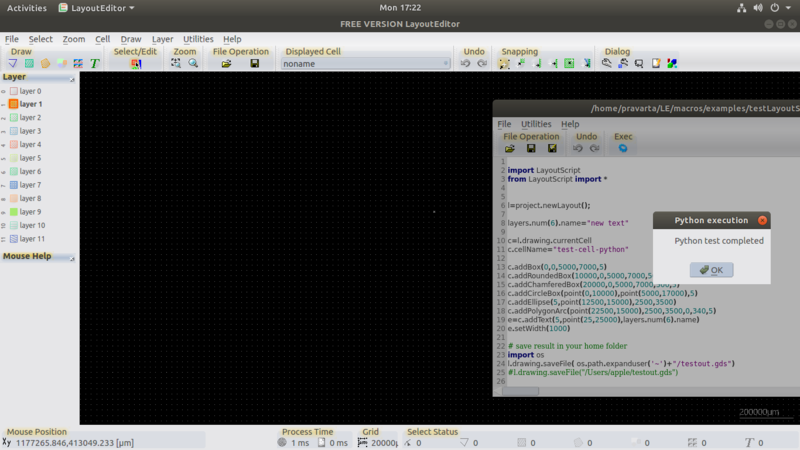 These C++-macros will read the parameter from the user interface and create the cell accordingly. Tuesday 29th May 2018 I try loading the pcell nmos in the open cell library and it got loaded but still couldn't change the parameters of the pcell. Tuesday 29th May 2018 You need to open it in the SchematicEditor form the *Components* sub-window. Once the cell is placed in the schematic you can edit the parameter with the edit feature. The layout is adjusted immediately. Thursday 31st May 2018 Can the nmos.layout script which is in the C language can be converted to the python script?? If so, can the python script reflect in the Layout Editor Window, without converting to the.gds format at the end?Because I come across the .gds format at the end of all the python script which is dispalying in the Layout Editor Window. Thursday 31st May 2018 The programming interfaces for C++Macros and python are very similar, so any C++Macro can be transfered to Python or Ruby and visa versa. To pass parameter from a component in the SchematicEditor to a Python script and to import the result of a Python script back to the LayoutEditor you would need a simple wrapper C++Macro. Thursday 31st May 2018 Could you please give me an example of wrapper C++Macro which integrates python and C language...for example: how to Implement In the nmos.layout script. Thank you.